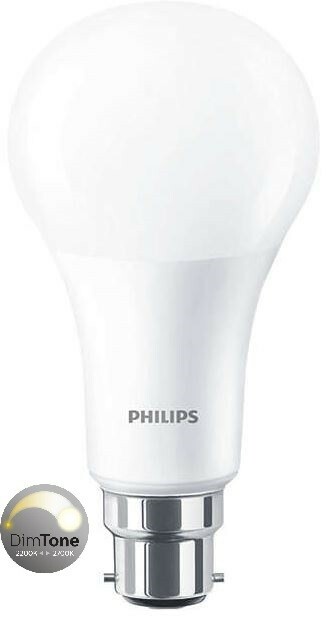 Philips MasterLED A67 15W=100W B22 DIMTONE frosted bulb delivers a DIMMABLE glow effect that dims-to-warm from 2700K down to 2200K for a welcoming warm atmosphere, and its unique design radiates warm light in all directions, making it a true alternative to the incandescent lamp. High performance Dimtone dimming means the more you dim the warmer the light. New form factor, innovative design, the best high performance dimming, light all around, warm white light, >80% energy savings, long lifetime. MasterLED bulbs are ideal for general lighting applications and are particularly suited to areas such as lobbies, corridors, stairwells, where the light is on for long periods. The A67 15W is compatible with existing fixtures which have an B22 bayonet holder, and is designed as a retrofit replacement for 100W incandescent bulbs. It can deliver huge energy savings (over 80% savings) and with a rated lifetime of 25,000 hours, minimises maintenance costs without any compromise on light quality. The A67 15W can be used together with most leading-edge dimmers, enabling further efficiencies to help customers recoup their investment in less than 1 year. Furthermore there is no harmful UV or IR in the beam.